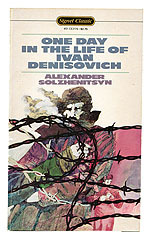 Citing specific evidence from Solzhenitsyn's One Day in the Life of Ivan Denisovich (not from the textbook), how was Ivan Denisovich able to resist the dehumanizing aspects of camp routine? You may consider submitting drafts of your assignment to your instructor for feedback before submitting the assignment for a grade. Please send some specific questions that you would like answered about your draft. The questions can be general (Is my introduction clear?) or specific (Is the phrase, "Chardin was jeweller," written correctly?). You can send in multiple drafts (within reason) of an assignment before you submit for a grade. At times, you may be asked to rewrite your essay before it is graded. This is done for your own benefit and will result in an improved grade. Before proceeding, you might wish to read the short notes and review the study questions on Solzhenitsyn. Your assignment should be sent to your course instructor following the directions for submitting assignments. Please take a moment to review Charlie's History Writing Center for specific information on the writing requirements for the assignments in the course. The Required Solzhenitsyn Paper is worth a maximum of 100 points.